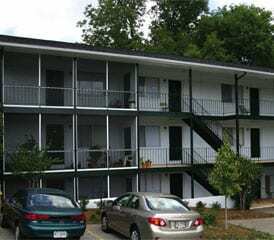 ATHENS, GA — Apartment complex manager Kole Parks wanted to improve the appearance of a building he owns overlooking downtown Athens and the University of Georgia campus. The 30-year-old building was in a desirable area, in good condition on the inside but lacked visual appeal and needed to be freshened up on the outside. Parks, who manages over 70 commercial and residential properties, decided to paint the dull grey exterior of the 12-unit apartment building an attractive bright white color. He also determined that he should entirely screen in the six perimeter apartments from floor to ceiling to improve the look of the building. He also wanted to cover the rather bland concrete floor with an attractive epoxy floor covering, install new doors leading from each new screen porch to the common areas of the building and paint the exterior doors black and the aluminum support columns and trim green. Parks’ uncle had used FAST Track™ system for an earlier project and suggested he research it online. FAST Track™ is a two-part extruded aluminum porch screening system for residential and commercial screen porches designed for framing and structural elements. FAST Track™ is available from Screen Tight™, a company headquartered in Georgetown, SC. Impressed by what he read on the internet, the way the system looked on his uncle’s property and the versatility it provided, Parks decided it would be a perfect fit for his remodeling project. 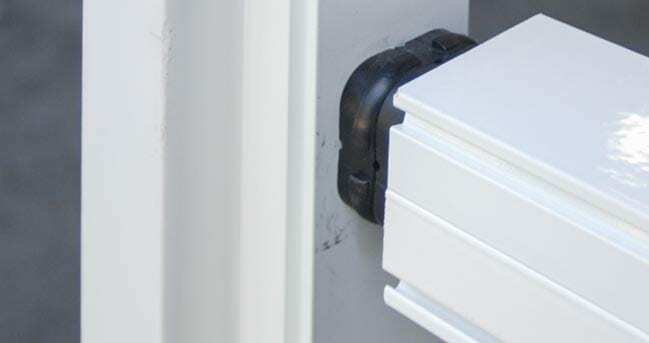 The features that most attracted him was that it could be installed from either the inside or outside of the porch and features 1-inch by 2-inch self-mating channels that completely hide the clip fasteners that attach to the frame for a clean and elegant look. To start the project, Parks ordered the six FAST Track™ systems directly from Screen Tight™, purchased six doors from his local hardware store to access the common areas in the building and gathered the tools he needed for construction including a chop saw, a hilti gun, flat spline, screwdriver, drill and rubber mallet. The two-part FAST Track™ system includes special 1-inch by 2-inch self-mating extruded channels and molded clips that snap together to 2-inch by 2-inch vertical posts or horizontal rails. Also included are pickets, picket adapters and single and double clips. Parks and his brother, who helped with the remodeling, selected 12-foot high power cooled extruded white channels. They marked each clip position at intervals of about 10-inches around the frame of the porch and then cut the 12-foot FAST Track™ channels to length. Next, they used a rubber mallet to snap the channels over the clips, installed the 12-foot tall vertical posts and then the horizontal railing system. Finally, they rolled the screen into grooves on the interior of the porch, fully encasing each 12-foot by 32-foot enclosure. Each time they started at the top, and worked their way down the sides and bottom of each section. Parks and his brother were pleased with how the system was designed, how easily it was to put in and would recommend it to people wanting to install a screen porch without the hassles of traditional systems. Since the FAST Track™ system has been installed there have not been any problems with the system. The additional benefit to Parks is the low maintenance the system requires after it is installed. After using the FASTtrack™ from Screen Tight, the apartment building has a new fresh look that the tenants love. The system features 1-inch by 2-inch self-mating channels that completely hide the clip fasteners for a clean and elegant look. FASTtrack™ was installed on six of the 12 units. This entry was posted in Project Profiles and tagged Fast Track.